Do you find yourself standing in your overstuffed closet every morning, scrambling to find something to wear? Do you ever wish you only had clothes you truly loved? Do you wish that getting dressed, and feeling great in what you wear, was easy? If you answered “yes” to any of these questions, then you might be ready to create a capsule wardrobe. Here’s what that means, how you can benefit from a capsule wardrobe, and how to create one. A capsule wardrobe is a small, high-quality clothing collection in which all of the pieces work together and can be seamlessly mixed and matched to create an endless number of classic and stylish outfits. The capsule wardrobe is nothing new; it originated in London during the 1970s, when clothing boutique owner Susie Faux coined the term. The idea caught on in the United States during the 1980s when Donna Karen created her “Seven Easy Pieces” collection. The goal of this collection was to help busy women simplify their choices while still looking effortlessly put-together. Although you might not realize it, you’ve likely already created a capsule wardrobe several times in the past. Every time you pull out your suitcase to go on vacation, you have to put together a basic streamlined wardrobe with pieces that can be mixed and matched and are appropriate for the weather wherever you’re going. Most of the time, you end up packing the same beloved pieces you regularly wear at home. This can free up a great deal of time and energy. Struggling every morning over what to wear can quickly lead to decision fatigue before you even start your day. When you have limited choices, you can save your brain power for important decisions at work or with your family. A capsule wardrobe can also save you a significant amount of money. With your new wardrobe, you no longer shop for trendy clothes that will go out of style by the end of the season. Gone are the impulse buys you pick up at the mall when you’re having a bad day — or a good one. Not only is impulse shopping a huge waste of money; it’s also terrible for the environment. It requires an enormous amount of energy to produce clothing. Think about a simple cotton t-shirt: the cotton must be planted, fertilized, watered, and harvested by heavy, diesel-powered farm machines. It must then be cleaned and shipped to another location, often thousands of miles away. Finally, it’s spun into cloth, dyed, and formed by workers who work in appalling conditions and typically earn less than $2 per day. 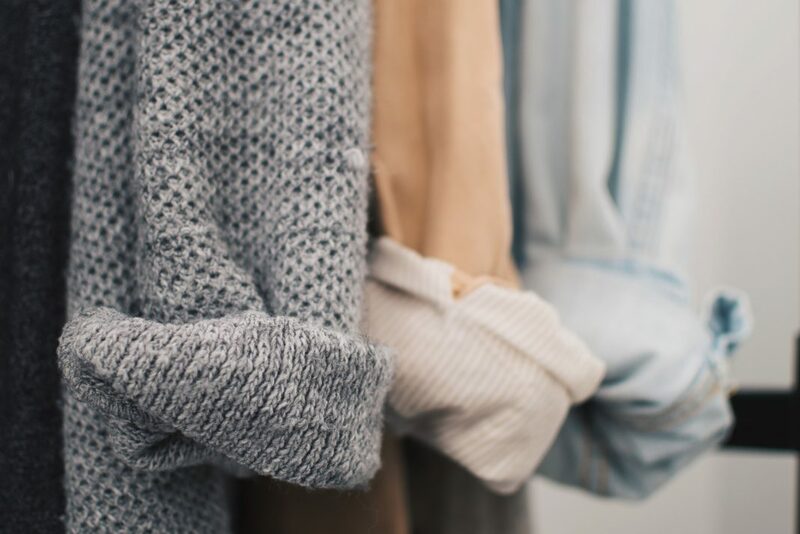 According to data published by the World Resources Institute, the average consumer purchased 60% more clothing in 2014 than they did in 2000, yet they kept each garment half as long. A capsule wardrobe is built around classic, high-quality pieces you love that, with a few adjustments, can be worn year-round. It also forces you to take care of your clothes and make them last longer, further saving you money. Before we look at how to build a capsule wardrobe, we first need to clear out your closet and organize your clothes. This can be time-consuming, but it can also be incredibly liberating. If you experience joy when you wear that piece of clothing, keep it. If not, toss it in the “donate” pile. One of the most enlightening experiences I had with my wardrobe came a year after the birth of my second son. I realized I was holding on to many of my favorite clothes because I might fit back into them someday. But so far, that “someday” hadn’t come, and my self-esteem was taking a hit just seeing these clothes in my closet. My body had changed due to having children, and I needed to let the old me go and accept the woman I now was. It was a liberating and empowering realization. I donated all the clothes that no longer fit and replaced them with ones that made me feel great. I don’t miss the old clothes. When you sort through your clothes, focus on choosing pieces that represent who you are right now. Let go of the idea that these clothes will work for you someday because the reality is that “someday” may never come. And that’s OK. Honor who you are today and build an uplifting wardrobe around that. Letting go of clothing isn’t an easy process, especially when you’re holding an expensive sweater you only wore once because it doesn’t fit right. It can be difficult to get rid of items we spent a lot of money on because we don’t want to feel like we made a mistake and wasted that money. However, it’s important to realize that the money you spent is gone, and holding on to that item of clothing won’t bring it back. Instead, if you have expensive pieces, consider selling them on eBay or taking them to a consignment shop. 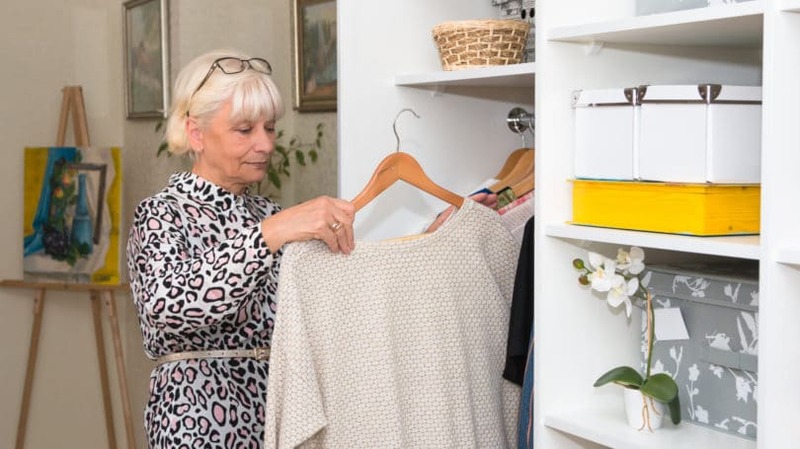 Another brilliant tip from Kondo is to evaluate each piece of clothing based on the role it played in your life, not how much you spent on it. For instance, that expensive sweater helped you see what you don’t look good in, and its role is now over. Say “thank you” for the lesson and let it go to someone else. It can also be helpful to read “The Joy of Less: A Minimalist Living Guide.” This book is full of great tips and strategies to help you purge your clothes, and it will also give you the inspiration and motivation you need to maintain a minimalist wardrobe in the weeks and months ahead. By the time you’re done, your closet will look positively scanty, and you’ll have a large pile of clothes with a lot of life left in them. If you’re wondering where to donate used clothes to charity, check out places like the Salvation Army, Goodwill, or Dress for Success. That last organization provides business attire for low-income women for job interviews. If you have the storage space, you might also want to put these clothes back for now until you have a yard sale. Selling high-quality clothes is one great way to have a successful garage sale. Don’t be afraid to do a trial run before you commit to a capsule wardrobe. Go through and pick out 20 pieces to build your basic capsule before you donate anything. Next, put everything else into a box and store it out of sight. For the next two weeks, only wear the pieces you picked out for your capsule wardrobe. Look at how you’re feeling after a week or two. What pieces are you missing, if any? If you discover you love having a capsule wardrobe, send all your extra clothes to the thrift store or find them a new home. What you choose to include in your capsule wardrobe will depend on your lifestyle and how minimal you want to go. For example, my capsule wardrobe has several tailored button-up shirts, including denim shirts, because that’s what I love to wear and what makes me feel great. I only own one high-quality t-shirt because they’re just not my style. Someone else might hate button-ups and want several high-quality t-shirts instead. Look at the clothes you naturally gravitate to and start building complementary pieces around your core favorites. Focus on neutral or complementary color schemes as you organize your wardrobe. Remember, these pieces need to be able to work well with most of the other pieces in your closet. Being able to mix and match items to create a wide variety is a key component of a capsule wardrobe. There’s no “set number” for your capsule wardrobe. Some fashion editors recommend sticking to 25 to 30 items, while others say 50 pieces, rotated over the seasons, is more realistic. The size of your capsule wardrobe is entirely up to you. My wardrobe hovers around 35 items, and I wear these 35 pieces all year. I almost never buy new clothes anymore because these pieces work for me spring, summer, fall, and winter. When I first organized my capsule wardrobe, I found it helpful to stick with a specific number of items. This prevented me from letting items creep back in, and it helped me avoid indecision over pieces I wasn’t quite sure I loved. If you’re struggling to decide what should go in your capsule wardrobe, there are millions of ideas on Pinterest to inspire you. Below are the items most women include in their capsule wardrobes. A Button-Up Shirt. A tailored button-up shirt is one of the classic pieces every woman should own. It looks great with jeans, and the sleeves can be rolled up for a more casual look in spring and summer. White, black, and denim are all good options. A Little Black Dress. A little black dress is a wardrobe staple you can use in many different ways. You can wear a blouse underneath it for work, add a scarf and a clutch for a night out, or throw on a denim jacket and some white sneakers for cocktails. You’re limited only by your imagination. Flattering Jeans. Nothing beats a pair of great jeans that make you feel absolutely fantastic. Focus on three key pairs: a light wash, a dark wash, and black. A Skirt. Your skirt can be a simple denim skirt, a classy pencil skirt, or a flowy boho skirt. Whatever skirt you choose, it should work well with the other items in your wardrobe. A Wool or Cashmere Sweater. Throw this sweater on top of a button-up and head to work, or layer it with a skirt and your denim jacket for errands or a night out. A Denim Jacket. Denim jackets never go out of style. They turn work clothes into casual clothes and give dresses a laid-back look. A Wool Peacoat. This is another classic that never goes out of style. J.Crew makes wonderful peacoats. You can also find some great options on eBay. A Trenchcoat. Trenchcoats add class to any outfit, and they’re great for the transitional seasons of spring and fall. A neutral color such as black, gray, or beige works best. When shopping for these items, look for pieces that will stand the test of time. Yes, you’re going to pay more, but sometimes it’s worth spending more to get a piece that will really last. And keep in mind that “expensive” doesn’t always mean “quality.” Luxury brands are made overseas, just like clothing from Target and Walmart. A good bet is to look for clothing from small companies that are made in America. Another way to find quality clothing is to feel it. Go to a high-end department store like Saks and browse around different brands. Look at the stitching, feel the fabric, and even try some pieces on. Then, go to a lower-end store like Target and do the same thing with their brands. You’ll be able to identify the differences right away. Again, an expensive piece isn’t always a quality piece, but by using your senses, you’ll learn how to spot something worth investing in. Your capsule wardrobe will also need accessories and several shoe choices. Accessories aren’t merely fun; they’re essential in helping diversify your wardrobe and make your staple pieces look different. If you’re sticking to a set number of wardrobe pieces, most fashion experts agree that accessories and shoes should not count toward this final number. One or Two Tailored Suits. A black, gray, or navy-blue tailored suit is one of those classic wardrobe essentials every man should own. Blazers. A tweed or houndstooth blazer can be worn with jeans to make any outfit feel more put-together. If you skip buying a suit, opt for gray or black here to match the most pieces in your wardrobe. Button-Up Shirts. White, black, gray, denim, striped — the world’s your oyster here. Again, focus on shirts you look great in that will work well with your blazer. Jeans. Focus on three pairs: a light wash, a dark wash, and khaki. One to Three Pairs of Shorts. These can be denim or chinos, whichever you like best. Five or Six Polo Shirts or T-Shirts. Some men only wear polo shirts, others stick with t-shirts, and some are fine wearing both. Choose five or six shirts you love and look great in, and get rid of the rest. Again, try to focus on neutral colors that pair well with your other staples. A Cashmere or Wool Sweater. When choosing a sweater, make sure it goes well with your button-ups and blazer so you can easily mix and match. Black and gray are usually safe choices. You can also add a lightweight cotton sweater for the cool nights of summer and fall. Ties or Bow Ties. If you wear ties or bow ties to work, sticking to four or five will be enough. Most people won’t notice if you wear the same tie twice in a week. A Peacoat. A great-fitting peacoat makes anyone look sharp. Go with navy blue or black. A Leather Jacket. Black leather jackets are edgy and full of style. Get one that fits you perfectly. High-Quality Handkerchiefs or Pocket Squares. These can be tucked into your suit to add a splash of color and variety. Cufflinks. Changing your cufflinks can make a subtle but powerfully different statement with your suit. Gloves. One pair of black or brown quality leather gloves will add class to an outfit. Shoes. Depending on your profession and personal style, you might need several pairs, including Oxfords, loafers, sneakers, boots, driving moccasins, boat shoes, or sandals. You’ll probably find that your capsule wardrobe is missing a few key pieces to make it complete. So, how do you buy quality clothing on a budget? Start by looking at what you need to complete your capsule wardrobe. For example, you might discover you need a high-quality wool or cashmere sweater for winter or a great jacket for spring. 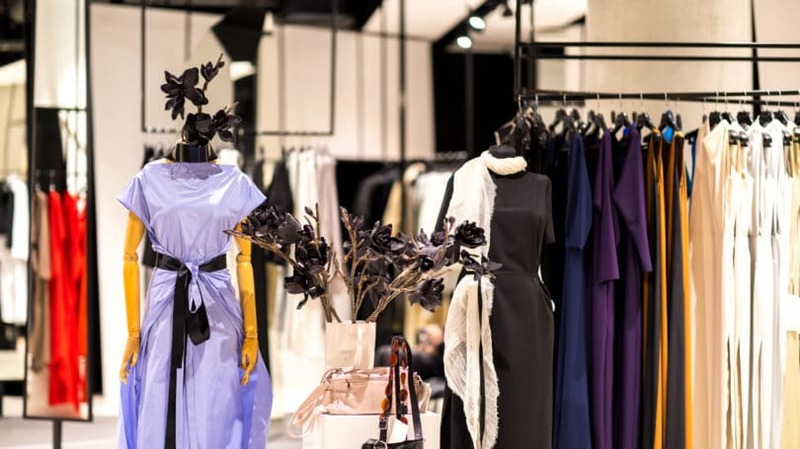 Visit discount clothing chains like TJ Maxx, designer consignment stores, or even eBay to get some ideas of which styles and designers you prefer. Another way to get discount designer clothes is to use a flash sale website to score a great bargain on quality pieces. You can get some incredible deals on these sites if you’re quick. If you decide to buy used, there are plenty of ways to save at thrift stores and consignment shops as well. Learn how to spot fake fashion and designer knock-offs so you don’t waste your money. You can also host a clothing swap party with your friends. 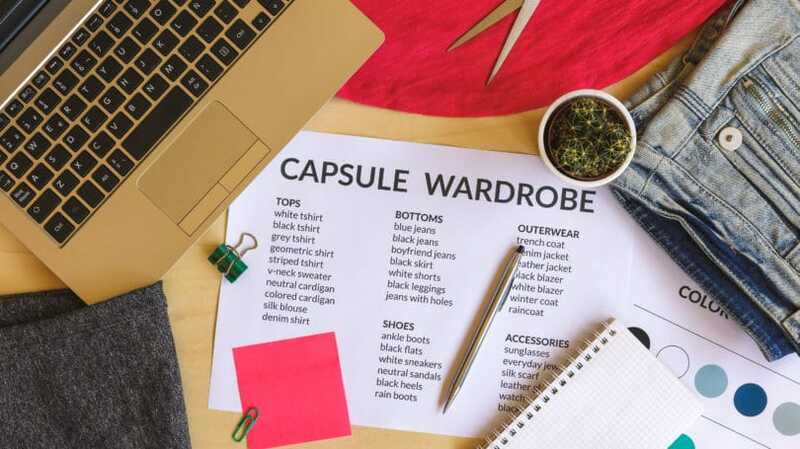 This can be a great way to save money on designer pieces, especially if your friends are interested in building a capsule wardrobe too. Keep in mind that the goal here is not to feel you have to “update” your wardrobe every three months with trendy or “must-have” items. That kind of mentality will quickly return you to the days of an overstuffed closet and a dwindling bank account. Remember that you want to focus on pieces that will never go out of style. Putting together a capsule wardrobe takes time and thought, but it’s well worth the effort. I don’t miss the days when my closet shelves were sagging with clothes, most which I didn’t like that much. Having limited choices, all of which I love, makes my life so much easier. I’m also happier because I feel great in everything I put on. Would you consider trying a capsule wardrobe? If you’re already using this concept, what lessons have you learned along the way?